I set a new PR for the mile on Monday: 6:40. 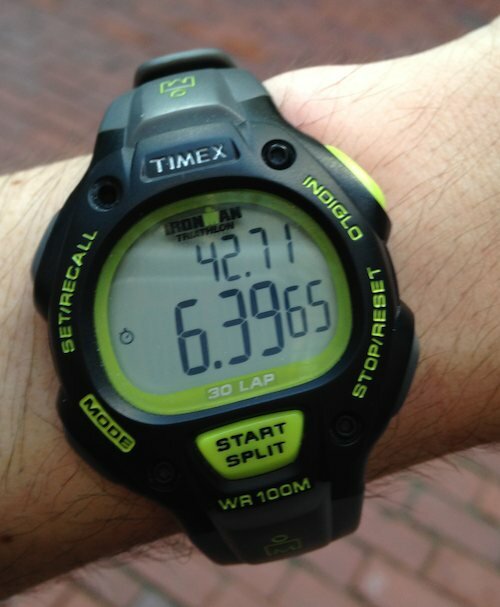 For whatever reason, my recent running workout regimen has been working out well, in terms of reducing my mile times. I thought I would document my running past, present, and future. 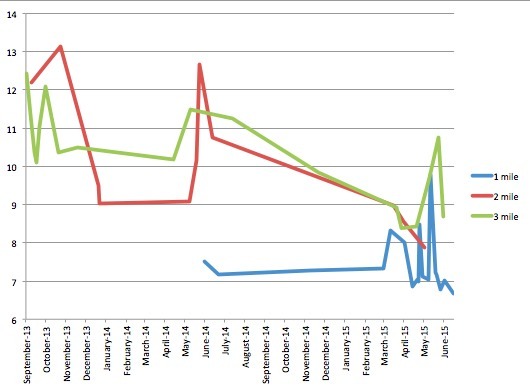 I began running more seriously in September 2013 after I sprained my thumb and had to stop lifting. I did my first 5k that month. I did a half-marathon in November 2013. I did a marathon in November 2014. A big problem with this data is that I don’t really have run times for these short distances around the times I was running intensively, to prep for my half-marathon and full marathon. Also, the observations we do have are sometimes instances where I got tired and had to pack my run in early — so they’re deceptively slow. This underscores the importance of having some kind of standardized run to track one’s progress. More recently, since I’ve been doing mile runs, I have standardized tracking, and it’s clear that I’m getting better. So it’s not necessarily clear that my new regimen is helping particularly — although it certainly feels like it is — but we do know that it is a regimen that works. June 22: 3 so far, will pick up another 3 on Friday due to stadiums + long bike on Sunday. Perhaps an additional easy mile run on Saturday. That will add up to 7, perhaps. This entry was posted in My Workouts, Progress Reports, Run, The Plan by tpowers123. Bookmark the permalink.